Horizontal and vertical IS and LM curves, an intuitive explanation of the implications - FreeEconHelp.com, Learning Economics... Solved! This post goes over the economic intuition of horizontal and vertical IS and LM curves in the IS/LM model. It develops the associated graphs, and talk about the fiscal policy and monetary policy implications of such slopes for the IS and LM curves. So we need to look for the influence of T and G in the following models to see what kind of impacts fiscal policy will have. Monetary policy can result in: higher/lower money supply, or higher/lower interest rates (if we assume discount rates affect the national interest rate). 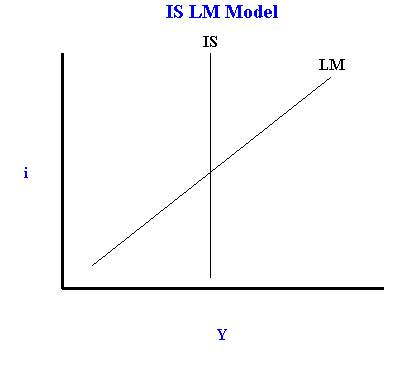 For descriptions of the variables check out this introduction to the IS/LM model. Note that lower case letters followed by numbers are arbitrary constants or coefficients. We need to identify which equations have T and G in them, and whether the effect is positive or negative. We see that each economy has T enter negatively and G enter positively which is what we would expect, so the standard impacts of fiscal policy apply. The key difference occurs in Economy B where Investment spending is independent of the interest rate. This means that the amount of private investment in the economy does not change as the national interest rate changes. This means that no “crowding out” will occur due to fiscal policy meaning that the full impact of the policy will be felt on the economy. Economy B is also unique, in that the IS curve will be vertical because no variable is dependent on the interest rate. Typically investment and/or consumption depend negatively on the interest rate which is what gives the IS curve its downward slope. Without this relationship, Y is just Y regardless of i hence the vertical IS. This same sort of logic can be applied to the monetary policy side of things. Typically the money demand equation (which looks like L(Y,i)) is a function of both real GDP (Y) and the interest rate (i). This holds true for Economy A and we get our normal upward sloping LM curve. However, when we look at Economy A and C, we see that i and Y are absent respectively. What implications does this have? In Economy C money demand only depends on Y. This will result in a vertical LM curve, because whatever the interest rate is, only a certain amount of money will be demanded. However, if there is any change in Y, the LM curve will have to shift (meaning an associated change in money supply or the price level has to take place). With respect to monetary policy, this implies that any change in the money supply will have a direct effect on real GDP since no adjustment in the interest rate will have an effect. Basically, if the Federal Reserve increases the money supply by $100, real GDP will have to increase by $100 to compensate. It is also possible that the price level, P could adjust, but I am assuming it doesn’t in this scenario. Finally, in Economy A money demand depends only on i. This will result in a horizontal LM curve, because whatever the real GDP level is, only a certain amount of money will be demanded. If there is any change in i, the LM curve will have to shift (meaning an associated change in the money supply or the price level has to take place). With respect to monetary policy, this implies that any change in the money supply will have a direct effect on the interest rate since no adjustment in Y will have an effect. 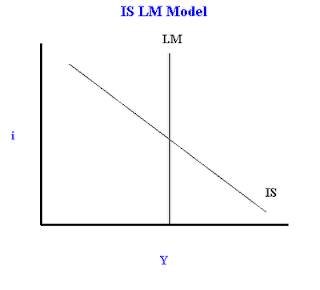 In Economy A with the horizontal LM curve, a change in fiscal policy shifts the IS curve and we will see a movement along the LM curve. Because the LM curve is horizontal, we will see only a change in Real GDP. This means that fiscal policy is super effect at changing real GDP because there is no change in the interest rate causing crowding out. A change in monetary policy will shift the LM curve, with an associated movement along the IS curve as normal. In Economy B with the vertical IS curve, a change in fiscal policy shifts the IS curve and we see a movement along the LM curve. A change in monetary policy shifts the LM curve and we see a movement along the IS curve which will ONLY change the interest rate, not real GDP. This means monetary policy is ineffective at increasing or decreasing real GDP. 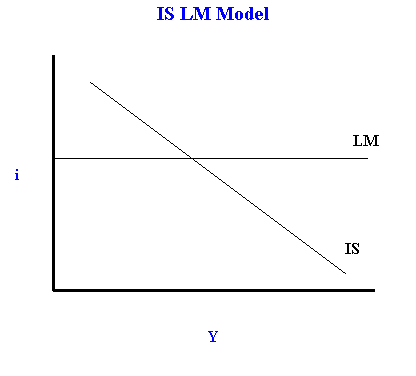 In Economy C with the vertical LM curve, a change in fiscal policy shifts the IS curve and we will see a movement along the LM curve. Because the LM curve is vertical, we will see only a change in interest rates, no change in real GDP. This means that fiscal policy is ineffective at changing real GDP in this situation. A change in monetary policy will shift the LM curve, with an associated movement along the IS curve as normal.